For some reason, in my mind “Quiet Time” became this big, important thing that was kind of elusive. The perfectionist inside me needed everything to be just right or I forfeited it altogether. If I couldn’t give an hour of uninterrupted study and prayer time, I gave none. Obviously I made it way too complicated, and basically sabotaged my own relationship with the Lord. He would never impose this on me – a perfect quiet time? What does that even mean? Now, as a recovering perfectionist, I can see how incredibly flawed this way of thinking is. I knew my quiet time needed to look a lot more accessible. More practical. More fitting for the current season of my life. It needed simplification. Less checklists and more being present. Less contrived and more organic. Ultimately, less of me, more of Him. I began reading Jessica Turner’s The Fringe Hours and I realized I had the time for Bible study, for sure. But I was continuously spending it doing other things that really have no bearing on my life. Things that need to be put in their rightful place. So what does my quiet time look like now? It’s not always the same and I don’t want it to be, because contrived and legalistic religion only serves me, not God. It’s just very normal and very simple. Sometimes I’m reading through half-asleep eyes and sometimes I only make it halfway through before I hear a baby crying for her mommy through the monitor. I often pick up where I’ve left off the morning before. But you know what? The Lord honors that time anyway. When I do manage to get up before the rest of my family, I head downstairs and fix a so-not-fancy cereal breakfast and sit in my comfy Ikea chair. I usually like to read from the She Reads Truth app on my iPad, but I also recently bought Savor by Shauna Niequist, and I’m excited to start it. I spend time just being quiet in a still house before the day really begins and my focus inevitably shifts. Once I implemented a more consistent quiet time, a funny thing happened. I craved more. The Lord began to show me what worship really is. Worship is not confined only to my Ikea chair with a book and a prayer at a designated time. It is not only accessible under a steeple on Sunday morning. It is to be the essence of my every day. My whole life. Who I am. It’s not so much an act as it is a state of being. 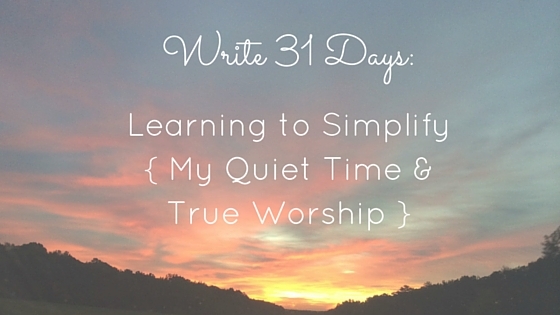 While we know that worship is a way of living, we fight our natural craving for routine and traditions and checklists. A lifestyle of worship takes time. It takes being intentional. It takes guidance from God to be kingdom-minded. Slowly, slowly, I’m learning and falling and getting back up and learning the lesson again. The Lord is sweet in His relentless patience with me. We were made to worship. We can’t NOT worship; the only question is who (or what) wins our affection? Our time, talents, and devotion? Only One is worthy.